What's your Name in Korean? Boy Abunda, (Eugenio Romerica Abunda), Jr. is a Filipino journalist, talent manager and television personality. He was born on October 29, 1955 in Borongan City. Abunda became a host of Show and Tell, a late night variety talk show with Gretchen Barretto, and Startalk, an entertainment talk show. In 1999, he moved to GMA Network's competitor ABS-CBN where he hosted The Buzz, Private Conversations, Home Boy and Kontrobersyal. Currently, he hosts The Bottomline with Boy Abunda, a talk show interview and SNN: Showbiz News Ngayon. While Mahal is Naomi Carpio in real life. 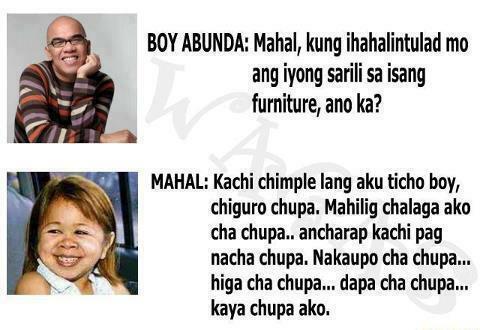 Check out this funny joke image about Boy Abunda and Mahal conversation which is posted, shared and gets viral on different social network and blog sites. For entertainment purpose only. Boy: Mahal, Kung ihahanlintulad mo ang iyong sarili sa isang furniture, ano ka? Mahal: Kachi chimple lang ako ticho boy, chiguro chupa. ,ahilig chalaga ako cha chupa..ancharap kachi pagnacha chupa. Nakaupo cha chupa... higa cha chupa.. dapa cha chupa... kaya chupa ako.